Oriflame has launched an exciting joining offer this month. Oriflame joining offer in November 2018 is that anyone can join Oriflame for free by placing an order above Rs 2000. Once you join Oriflame you can get gifts worth 3000 in the first 3 months as part of the Oriflame welcome program. You can also earn monthly income as you recruit, train and develop a team of Oriflame consultants. In this Recruitment Campaign anyone can join Oriflame and become a Manager. During this Oriflame Joining offer anyone can join Oriflame and get this collection for themselves. For those who want to join Oriflame there is a prospect offer and for those who are already Oriflame Consultants there is a Sponsor offer. When you place accumulated personal orders of 100 Bonus Points during your first 30 days as an Oriflame Consultant and get your first welcome program gift in the form of Oriflame products! When you place accumulated personal orders of 100 Bonus Points in your second month in Oriflame you get more products as gift from Oriflame! When you place accumulated personal orders of 100 Bonus Points in your third month in Oriflame you get even more Oriflame products as gift! How to get your Welcome Program gifts? Claim your Welcome Program products in the following month while placing your order! Wow! This is an exciting joining offer from Oriflame! 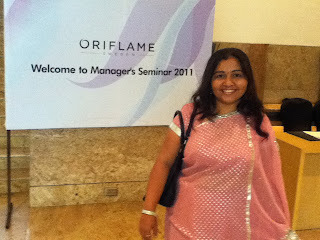 I wish Oriflame Consultants in India all the very best for this campaign.